Humanity’s ever-increasing hunger for mineral raw materials, caused by a growing global population and ever increasing standards of living, has resulted in economic geology becoming a subject of urgent importance. This book provides a broad panorama of mineral deposits, covering their origin and geological characteristics, the principles of the search for ores and minerals, and the investigation of newly found deposits. Practical and environmental issues that arise during the life cycle of a mine and after its closure are addressed, with an emphasis on sustainable and "green" mining. The central scientific theme of the book is to place the extraordinary variability of mineral deposits in the frame of fundamental geological processes. The book is written for earth science students and practicing geologists worldwide. Professionals in administration, resource development, mining, mine reclamation, metallurgy, and mineral economics will also find the text valuable. 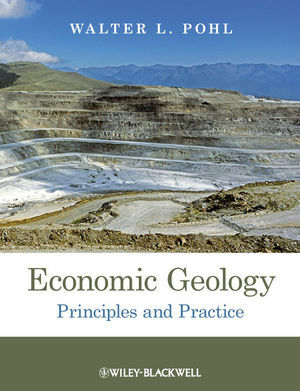 Economic Geology is a fully revised translation of the the fifth edition of the German language text Mineralische und Energie-Rohstoffe. Additional resources for this book can be found at: www.wiley.com/go/pohl/geology. The author's website can be found at: http://www.walter-pohl.com. Walter L. Pohl is Emeritus Professor and former Dean of the Faculty of Geosciences at the Technical University of Braunschweig, Germany, and a consulting geologist in economic, engineering and environmental geology. For more information visit http://www.walter-pohl.com. Mining in the stress field between society and environment. Part I Metalliferous Ore Deposits. 1 Geological ore formation process systems (metallogenesis). 1.1 Magmatic Ore Formation Systems. 1.2 Supergene Ore Formation Systems. 1.3 Sedimentary Ore Formation Systems. 1.4 Diagenetic Ore Formation Systems. 1.5 Metamorphic and Metamorphosed Ore Deposits. 1.6 Metamorphogenic Ore Formation Systems. 1.7 Metallogeny – Ore Deposit Formation in Space and Time. 1.8 Genetic Classification of Ore and Mineral Deposits. 1.9 Summary and Further Reading. 2 Economic geology of metals. 2.1 The Iron and Steel Metals. 2.5 Minor and Speciality Metals. Part II Non-Metallic Minerals and Rocks. 3 Industrial minerals, earths and rocks. 3.1 Andalusite, Kyanite and Sillimanite. 3.6 Carbonate Rocks: Limestone, Calcite Marble, Marlstone, Dolomite. 3.7 Clay and Clay Rocks. 3.16 Mica (Muscovite, Phlogopite, Vermiculite). 3.21 Quartz Sand and Gravel. 3.22 Sodium Carbonate, Sulfate and Alum. 3.28 Summary and Further Reading. 4.1 Salt Minerals and Salt Rocks. 4.2 The Formation of Salt Deposits. 4.3 Post-Depositional Fate of Salt Rocks. 4.4 From Exploration to Salt Mining. Part III The Practice of Economic Geology. 5 Geological concepts and methods in the mining cycle: exploration, exploitation and closure of mines. 5.2 The Search for Mineral Deposits (Exploration). 5.3 Development and Valuation of Mineral Deposits. 5.4 Mining and the Environment. 5.5 Deep Geological Disposal of Dangerous Waste. 5.6 Summary and Further Reading. Part IV Fossil Energy Raw Materials -- Coal, Oil and Gas. 6.1 The Substance of Coal. 6.2 Peat Formation and Coal Deposits. 6.4 Post-Depositional Changes of Coal Seams. 6.5 Applications of Coal Geology. 6.6 Summary and Further Reading. 7 Petroleum and natural gas deposits. 7.1 Species of Natural Bitumens, Gas and Kerogen, and their Properties. 7.2 The Origin of Petroleum and Natural Gas. 7.3 Formation of Petroleum and Natural Gas Deposits. 7.4 Exploring for Petroleum and Natural Gas Deposits. 7.5 The Exploitation of Petroleum and Natural Gas Deposits. 7.6 Tar Sand, Asphalt, Pyrobitumen and Shungite. 7.8 Environmental Aspects of Oil and Gas Production. 7.9 Summary and Further Reading.